Our client, age 22 and planning a career as a registered nurse, was returning from a Long Beach bar with her boyfriend. Our client was driving. As they were exiting the northbound 110 Harbor Freeway at Torrance Boulevard, our client’s boyfriend ordered our client to stop the car while she was still on the off ramp. In a Nutshell: In the past, when a police officer failed to certify a breath test, one could “win” at the DMV, meaning the DMV would reinstate driving privileges. This argument does not prevail quite so much nowadays, but the following summary shows a case when such facts were considered determinative. Our client did so. Her boyfriend then jumped out of the car to urinate. He had drank too much. Unfortunately, at the same time, a CHP officer was exiting the same off ramp behind our client, who was stopped at this point. Anyone who is familiar with this area knows that there is a CHP station nearby alongside the freeway. 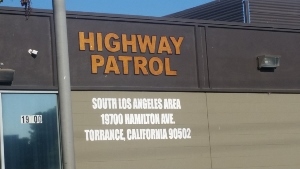 The CHP’s attention was drawn to our client’s boyfriend, as it was unusual to see a person urinating in the open while standing in shin-high iceplant, but they ordered our client to exit the freeway and park along Figueroa, which our client did. There was apparently a great deal of confusion at the scene (most likely because the CHP were concerned for the safety of the boyfriend alongside the offramp), so much so that while the CHP did administer a breath test at the scene of our client, the officer neglected to properly record the results. The results were recorded as 0.10% and 0.10% blood alcohol content (BAC).. The DMV requires that the results of any roadside breath test be reliable, so all such results must be presented with an Officer’s Certification concerning the procedures followed, the make and model number of the device used and its serial number. The CHP officer failed to do any of these things. He just wrote down the numbers. It merits mention that in a DMV hearing, there is only one document that is signed under penalty of perjury and thus considered most reliable. A police report, for example, is not signed under penalty of perjury. The one document signed under penalty of perjury is the Age 21 and Over Officer’s Statement, or DS-367. In this case, it was not properly completed, so we argued the DMV could not rely upon it. The CHP then transported our client to the CHP station, where they attempted to elicit a breath test on their machine there. The machine, however, was not working properly, so the CHP took our client to another police station in Lynnwood to have her provide a blood sample. However, by the time the blood was drawn, it was more than three hours after our client last drove. Under California Vehicle Code § 23152(b), this meant that the blood results cannot be used to show the BAC of our client while driving. Our office argued this and that the DMV may not reverse extrapolate the BAC to any level by adding to the blood results based on how much an average person would have metabolized ethanol over three hours. We cited to several cases that prohibited such an approach. One is a Texas case, but it is the only one that addressed the technique directly. Raul Mata v. State of Texas (1994, Fourth Court of Appeals) No. 133-00, footnote 79 (retrograde extrapolation should not be relied upon in a criminal case). Our office argued both these points to the DMV in a thirteen page DMV brief. The DMV agreed with us, setting aside the suspension. This was a big relief to our client, as she needed her driver’s license to continue attending classes toward earning her license as a registered nurse.